If you drive an SUV, you will want a tire which doesn’t leave you high and dry in the middle of nowhere. Whether revving up a thrilling jungle trail, navigating your way out of a frightening rainforest, or flying off the starting rump at the start of a desert race, the tire must be tough, and perfectly able to handle your vehicle in extremely challenging conditions. And that’s where the best all season tires for SUV come in. Time and again, these tires have the adaptability, oomph, traction, and the build to ride the storm in all conditions whatever the season. 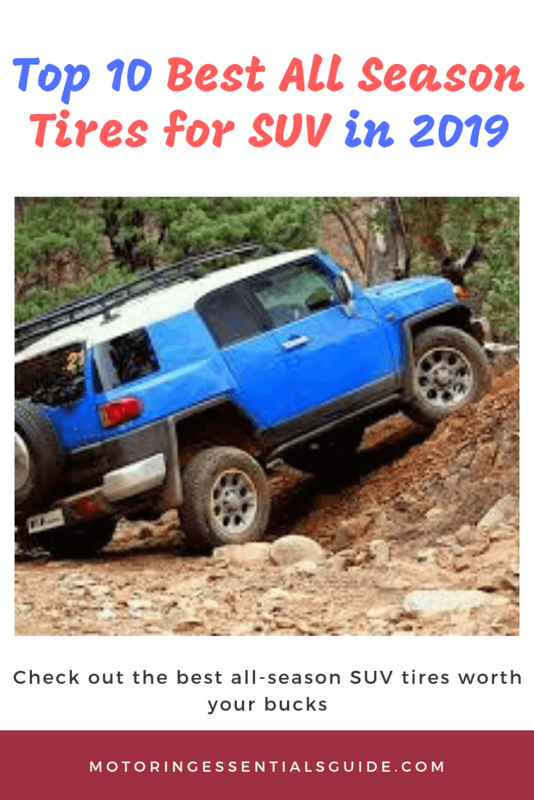 Without further ado, here’s a list of the best tires for SUV all seasons in 2019. Coming up after the review is a buyer’s guide for this class of tires. The innovative sipe design gives it a biting edge in snow while its asymmetrical tread pattern improves the grip on all surfaces. You will also enjoy an almost whisper quiet and comfortable ride from the fine-tuned tread pitch sequence. In addition, the steel belts combined with the nylon wrapper ensure that it can outlast many of its peers. Throw into the mix its incredible acceleration, stability, and superior navigation over dirt roads and you begin to understand why this is a favorite of many SUVs enthusiasts. This tire offers excellent handling and a luxurious ride thanks to its adaptability in different environments. The enhanced tread and overall construction make it a potentially great all-rounder. Despite already having several other famous all-season tires for SUVs, Michelin is still producing more classic options. The latitude tour is one such tire and comes off as another natural performer. This tire isn’t just a refined world-beater on dreadful conditions, though, as it’s also abundantly endowed with the technical acumen required of a modern-day SUV tire. I’m referring to the special rubber compounds coupled with its wide groove tread which team up to enable the tire to stop shorter. Equally important is its computer-optimized design plus precise manufacturing which help to reduce road noise and vibrations. The Michelin latitude tour delivers a world-beating performance time and again thanks to its powerful technology. Indeed, its computer-optimized design exceeds all expectations! This tire overall scores rank pretty well and actually goes a step further to spring a few surprises. The tire’s special eco-friendly design gives it one of the highest mileages (65,000 miles) across our entire shortlist- meaning you will save some bucks since you don’t have to replace it as often as some of its competitors. You will also make more savings from its low rolling performance which –at an optimal pressure- enables it to consume less fuel over a mile. Something else to be proud of is its agility which enables it to conquer severely demanding terrains upcountry without breaking a sweat. Packed full of eco-friendly features and with an agile spring around the roads, this Scorpion Verde tire from Pirelli could be all your SUV or CUV needs throughout the year. And there’s a money savings bonus from its fuel economies! Michelin’s celebrated EverGrip wet-braking technology makes this a leading choice among the best tires for SUV all seasons. The technology gives the tire brilliant traction and steady all-season handling while remaining comfortable on-road as well as off-road. Steering is easy while it pulls through hilly areas with admirable agility. Lastly, the top rated tire’s responsiveness when taking corners is among the best. Michelin ranks on top of the smoothest riding suv tires. The tire’s EverGrip compound with its numerous tread blocks and extra sipes gives it the cutting edge in snow. Its flexibility helps it deliver even in dry conditions making it a potential jewel. The general grabber HTS60 is rated as one of the top all season tires for SUV and has maintained a positive reputation for years. And you will notice the difference the very first time you get hold of it- good ride comfort, low road noise, and lengthy tread life are some of its exceptional qualities. The best SUV tire comes with a rare cut/chip resistant tread compound, reinforced with muscular steel belts plus a broader flat contour which makes it almost impregnable. Furthermore, it has a noteworthy absorption layer that insulates the car against road disturbances, while impeding any sounds coming from the central part of the tire. Its handling and braking are also top-level. The general grabber HTS60 is cut out for the SUV and excels on multiple dimensions. From its wear resistance features, stability, and responsive handling, this is up there with the best. The continental crosscontact LX is a king on the road and is one of the tires with immense potential. This is perfectly underlined by the tire’s proficiency either on the high-speed highway or off-road with a solid year-round traction and its skillful handling even under a storm and light snow. A sporting tire by trade but adept almost everywhere else, the top rated all season tire for SUV has the wonderfully engineered tread blocks to thank for its famed all-season wet braking and the whisper-quiet, cozy rides. If you are looking to arm your crossover and SUV for the performance you have always dreamt of, then this could be the perfect weapon. A silent star and perfect for crossovers and SUV touring, this all-season tire is a master of the road. On full-gear, not even light snow will stop it! While the Bridgestone Dueler H/L ecopia is, by and large, an accomplished performer, and the crown in the jewel is its continuous ribs. The thing is, the SUV tire provides premium traction and simultaneously reduces risky heat buildup on the tread- a problem common on some of the weaker models – as well as decreasing noise. And just like its Scorpion Verde tire from Pirelli, The Bridgestone Dueler H/L has minimal rolling resistance and will deliver super savings from the fuel economy. It, however, tops tires such as the Cooper Discoverer H/TP on corner handling, CO2 emissions, and wet traction as a result of the improved Silica-Based tread compound. In the light of the reduced heating and the improved wet traction, the Bridgestone Dueler H/L Ecopia is another authority tire from our carefully chosen collection for Crossovers/SUV Touring. On top of that, it never wobbles on the road! Given its movement and high-caliber masterly of both the wet and dry roads, the Goodyear Assurance CS TripleTred tire offers a reassuring drive all year round. The revolutionary traction grooves are the secret here as they help maintain heavy traction in rain/snow — even as your tire begins to wear. Looking at its other features, it’s easy to see why it has been attracting such raving reviews. For instance, its lightning-quick speeding and wonderful resilience are certainly more than capable and should give your SUV the power to shine wherever it goes. In short, it could be superb for stylish CUVs and SUVs. A hero of the wet and the ice, this tire’s revolutionary traction grooves maintain a confident gait in the drizzle and snow – even as it ages. A consistent servant, The Roadian Pro RA8 opens up a world of possibilities whether off-roading, maneuvering heavy terrain or wandering about on city roads. The extra-large dual block shields the all-season SUV tire from harm when on gravel and other uneven surfaces whereas the staggered center rib strengthens the biting edges to give it magnificent traction in rain and snow. Its micro groove further helps to stabilize it and improve the steering and handling technique. On the whole, given its versatility and wider design, this could push your SUVs performance to the next level. Consistent and trustworthy, the Nexen Roadian Pro RA8 is a surprisingly gifted tire at this level. In all conditions, and throughout the year, its results are admirable. Nitto NT421Q is a technological marvel and subsequently very reliable. Most outstanding is the 3D multiwave ably backed up by the 3D interlocking sipe plan which gives it the essential traction while maintaining neat handling capability. It’s also very good in potholes and bad roads and has the circumferential rubber shoulder inserts to thank for the extra absorption ability. Plus, the interior tread design is intentionally customized to boost traction and wet maneuvering capacity. Also noteworthy is the larger tread blocks found on the exterior because of their stabilizing feature which helps it to navigate corners like a champion. The Nitto NT421Q is an innovative tire and a popular choice. Its wet handling, corner tackling, dry conditions masterly, and stability rivals the best the market has to offer. Getting the right tire from the many options is easier when you know the deal breakers. Though most of the tires have wide ranging sizes, there’s still an odd chance that the tire that has blown you off the feet may not fit your car. Double check before committing to avoid disappointments. Certainly, some of the tires have lower shipping costs. Then, you will need to pay for mounting which can be from about $60 to $100 for a set. Now, if you have two or more models with similar features but have different carrying costs, it would make economic sense to choose the more affordable one. Also, purchasing tires that last longer will ensure that you save some bucks since you won’t be facing multiple installations. All tires have speed ratings which determine how fast you can ride your SUV safely on those tires. They range from approximately 75 mph-186 mph. A tire for SUV rated “H” (high performance tire) can hit speeds of 130 mph. A “W” would attain about 168 mph and so on and so forth. Tires with higher ratings offer extra handling benefits that excite some drivers. But lower ride comfort, reduced performance in snow and less tread life. If your job involves hauling a lot of cargo, it’s important that you pick a tire with matching load capacity. The higher the load index value on your tire, the more your choice can carry. For instance, an index of 81 typically carries 1,019 lbs. while 110 would comfortably transport 2,337 lbs. Most tires for SUVs all-season tires have significant treadwear warranties. That’s you’re guaranteed a certain number of miles and if they worsen before the stated limit, the company can return part of the money. Some guarantee to last at least 40,000 while some can go for up to 70,000 miles. Obviously, a longer warranty is more reassuring. The best tires for SUV all seasons help contemporary SUVs to deliver a breathtaking performance. They are perfectly optimized for a superb act, light-duty towing, off-roading capabilities, and smooth on-road drive. And with the wide array of choices, you’ll be spoilt for choice. Brands like the popular Michelin Defender LTX, Continental – ContiCrossContact, and the Pirelli Scorpion Verde are in a class of their own. But there are other stars in the market if you’re to do a bit of digging. Whichever your choice, one thing is clear: your SUV deserves a heroic tire if you’re to maximize it.